The Hall County Planning Commission voted Monday, April 15, to postpone hearing about Reveille, a proposed 509-acre, multi-use development in South Hall. 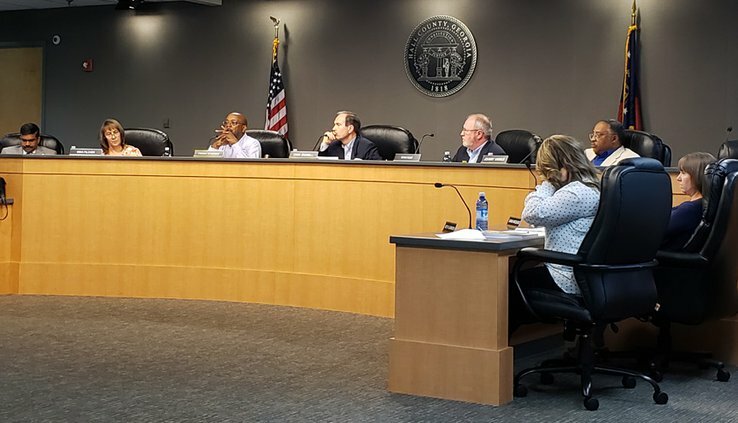 Updated: April 15, 2019, 7:47 p.m.
A proposed sprawling, multi-use development in South Hall now will be heard by the Hall County Planning Commission on May 20. The commission voted Monday, April 15, to postpone hearing details about Reveille — the name for a 509-acre development featuring nearly 2,000 homes — at the developer’s request. “There’s been a request from some neighborhood groups in that area to meet with the applicant to talk about (the project), and so we’ve agreed to do that,” said Steve Gilliam, lawyer for the proposed development. Reveille, off Old Winder Highway/Ga. 211 at Union Church Road, would replace Atlanta River Walk, which was approved in 2016 and featured a man-made river as a key attraction. In addition to the river, a theater, convention center, grocery store and one of two hotels are gone from the new plans. Instead, Reveille would feature 482,415 square feet of retail space, 1,969 residential units, 8.4 acres of outparcels and a 175-unit hotel. Henry W. Massie, senior vice president of Atlanta-based Rotunda Land & Development Group LLC, has said that if all goes well, “we expect to be breaking ground” in late 2019.